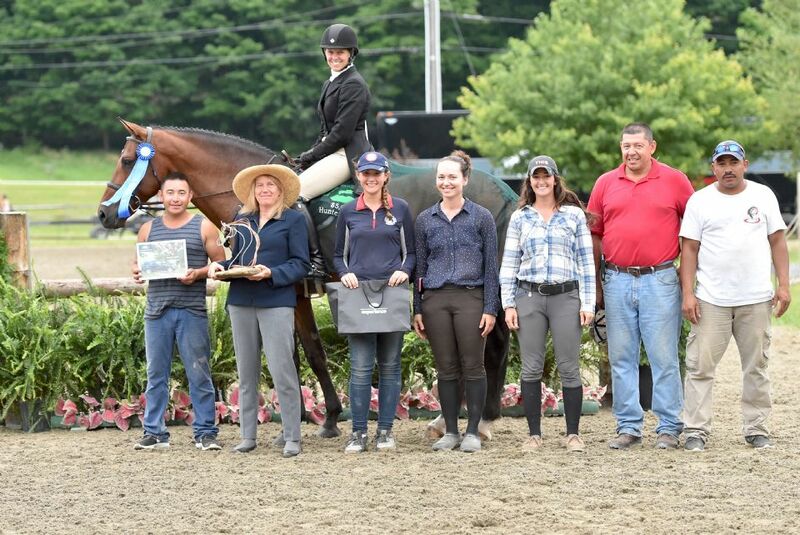 East Dorset, Vermont – Jennifer Bauersachs of Frenchtown, NJ, rode Overjoyed to her second consecutive $5,000 3’3” NEHJA Hunter Derby, presented by Eastern Hay, on July 28 at the Vermont Summer Festival in East Dorset, VT. The Vermont Summer Festival runs for six consecutive weeks from July 5 through August 14 at Harold Beebe Farm. Forty-nine horses jumped the first round course in Thursday’s derby, designed by Doug Russell of Ocala, FL. The courses spanned two rings and incorporated regular hunter fences as well as traditional derby obstacles. by Eastern Hay, on July 28 during week four at the Vermont Summer Festival. Bauersachs and Overjoyed, owned by Courtney Carey, advanced to the handy round among the top twelve and turned in an impressive performance to take the win. Her first round score of 80 combined with an 85 to settle her and the eight-year-old Rheinlander gelding on a total score of 165. Robbie Burroughs of Hackensack, NJ, and Allure, owned by E.K. Equestrian, LLC, led the first round with a score of 84 and returned to collect an 80 and finished in second just one point shy of the lead with a 164. 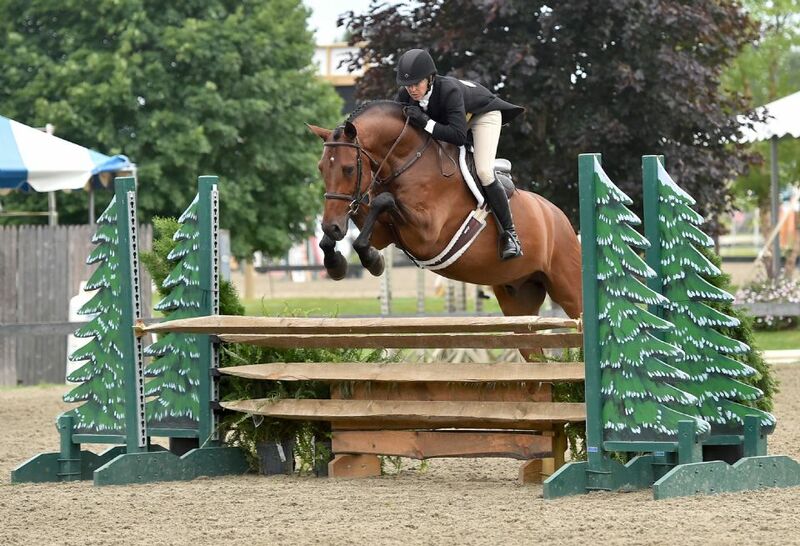 Claire Kenna of Wakefield, RI, boasted the highest score over the handy course with an 86 aboard her own Corice Z. The high score of the day combined with a 76.5 from the first round to settle Kenna on a 162.5 and third place. Gillian Galvin of Norwalk, CT, and her own Easy B were consistent with a pair of 81s in both rounds to take fourth with a final score of 162. Margot Peroni of Califon, NJ, rounded out the top five with her own Encore B on a 161 after jumping to scores of 79 and 82. Sixth-place honors were awarded to Amanda Steege of Bedminster, NJ, and Zidane, owned by Susan Darragh, on scores of 76.25 and 84 for a 160.25 total. Steege’s performance earned her the Kastel Denmark Ladies Style of Riding Award. After Bauersachs won the week three derby in Vermont in the irons of Cleaveland, she returned on Thursday to win again. $5,000 3’3” NEHJA Hunter Derby, by Ann Jamieson of Eastern Hay. Overjoyed has jumped in four derby events now and has been knocking on the door of a win with several top placings. In addition to her share of the prize money and a commemorative scrim from Mona’s Monograms, Bauersachs was presented with a Land Rover Experience Driving School off-road excursion from Ann Jamieson, representing class sponsor, Eastern Hay. Photographs may be used one time only in relation to the above news item. For high resolution photographs, please e-mail: lindsay@jumpmediallc.com.